Explore the mysterious LEGO® City jungle and make amazing discoveries! Load your boat with gear and head into the unexplored depths. Look at that exotic frog! Stop and grab your magnifying glass to take a look, while the pilot keeps an eye on the giant crocodile. Watch out, there's a snake in the tree! Grab the snake stick to remove it and discover a secret space in the trunk. What will you find? Price is 22% below the initial Lego retail price, a € 2.28 discount! This comes down to 9.45 cent per brick. 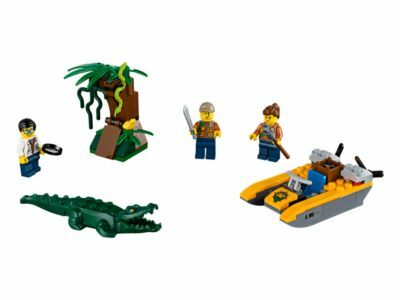 The Jungle Starter Set (60157) Lego set is available from the sites below. However, they do not offer delivery to your selected region. The Jungle Starter Set (60157) Lego set is no longer directly available from the sites below. However, 3rd party partners of these sites might still have the set available. Alternate description Cruise into the jungle and make a big discovery!